Taste, like language, is learned. 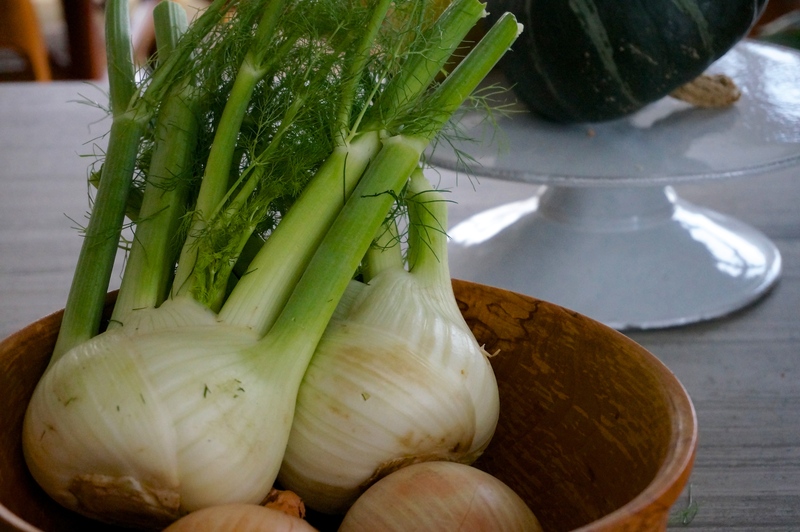 We grow up eating certain foods and experiencing certain flavors. We do so during our most formative years, our childhoods, and so we connect them, strongly, with events and feelings. Our memories become multi-sensory and they are brought to the surface with a simple bite or a bare sniff. We all have our Proustian madeleines. For me, it’s Middle-Eastern food (and I include Greek food in that category). No matter what it is and what its country of origin, Greek, Turkish, Lebanese, Syrian, it’s food that feels like home. It’s my comfort food. When I saw this recipe on Chocolate & Zucchini, I knew that I would love it. Combining za’atar (the spice mix found throughout the Middle East) and pomegranate molasses makes complete sense for my taste buds. And I was right. 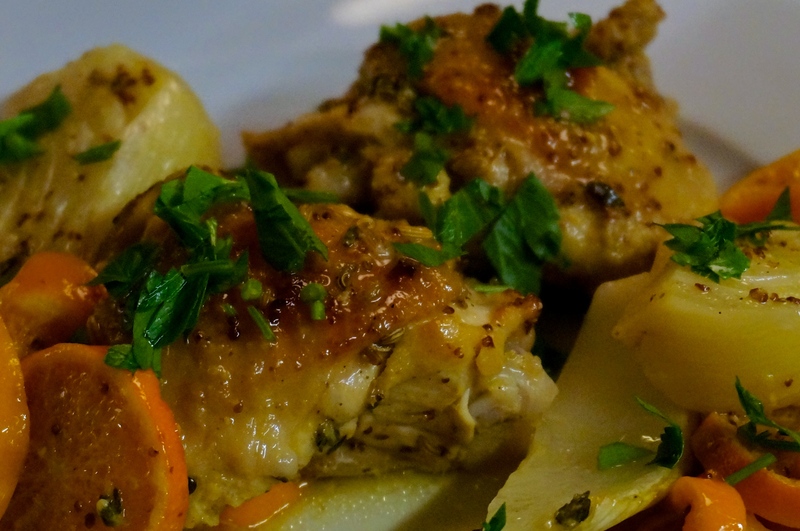 The result is succulent chicken that is deeply fragrant from the za’atar spices, with a tangy sweet sauce and caramelized onions. It warms your soul. It’s the kind of dish you serve and people immediately ask for the recipe, which is incredibly simple to make. And for some of us, it tastes like home. 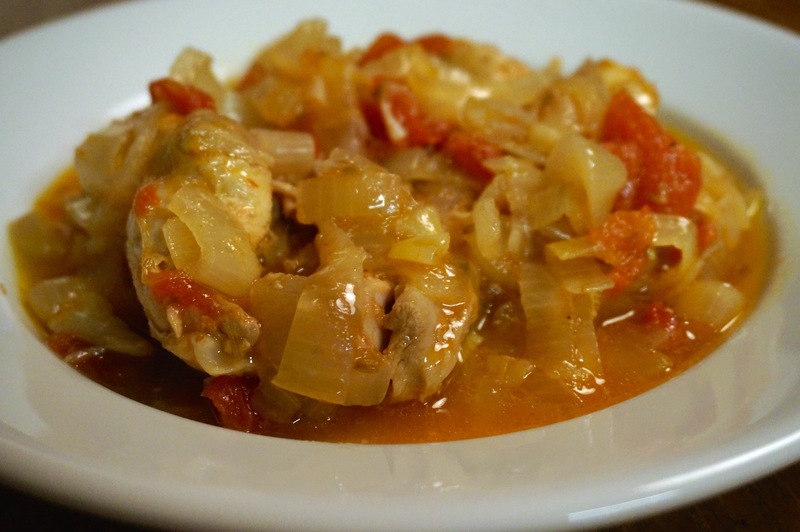 In a large bowl, whisk together all the ingredients except the chicken, the onion, and the garlic. Add the diced onion and stir well. Add the garlic and the chicken thighs and use your hands to mix them well with the marinade. 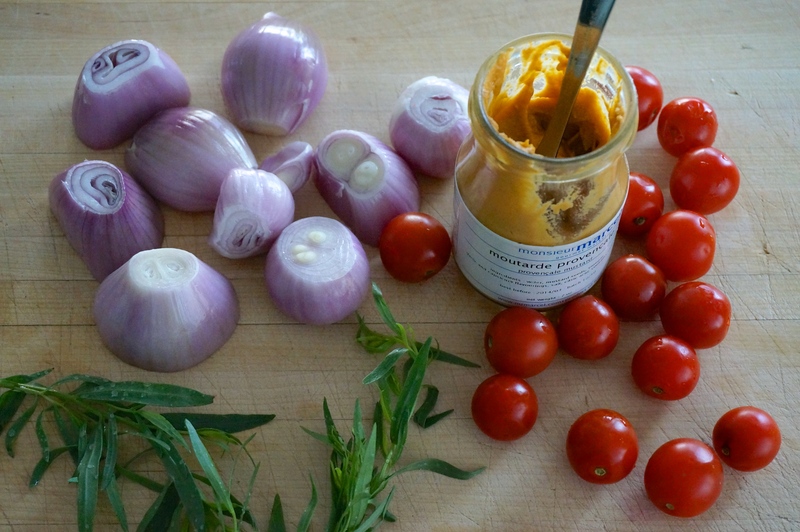 Cover and marinate in the fridge anywhere between 30 min and 10 hours. Preheat the oven to 175°C (325°F). Place the chicken with its marinade in a Dutch oven or other heavy, ovenproof pot with a lid. Place the lid on the pot, put it in the oven, and cook for 1 1/4 hours, until the thighs are cooked through. Serve with steamed rice or couscous, spooning the sauce over the chicken and the rice/couscous. Remember when Steve and I went gluten-free for three weeks, with unintentionally hilarious results? Well, we are now finishing week two of a new dietary experiment: eating dairy-free. For the last two weeks we have stopped eating any form of dairy, once again to see if it helps at all with my chronic inflammation issues. So far, nothing has changed. We haven’t had any new flare ups, like we did when we went off gluten, but it’s not looking like dairy is really the culprit. We’ll give it another week. The interesting thing is that we find going dairy-free harder than going gluten-free. Milk and its byproducts are in everything. Getting a sandwich for lunch becomes a real challenge when you don’t know if the bread has been made with milk or butter (which is very common). Eating breakfast is even more difficult for us, given our love of baked goods in the morning. And cream and cheese are incredibly common in so many dishes and different cuisines, from Italian to Mexican to Indian. We’ve been eating a lot of Chinese and Japanese food that is generally free of dairy. For the mornings, we’ve been using a cashew milk we found at the store that is similar to the almond and macadamia milk I wrote about last time. It’s ok in coffee and for granola but it’s definitely not the same as cow milk. In a week we will start eating dairy again, unless we see a dramatic change in the next few days. One of the first things I plan to make is this chicken cooked in milk. It sounds strange, I know, but it’s based on a recipe by Jamie Oliver that has become somewhat of a viral sensation. This version uses a slow-cooker, as opposed to the original that bakes the chicken in the oven. The result is astonishing. The chicken is tenderized by the milk to such an extent, that removing it from the slow cooker in one piece is impossible. The meat literally falls off the bone. 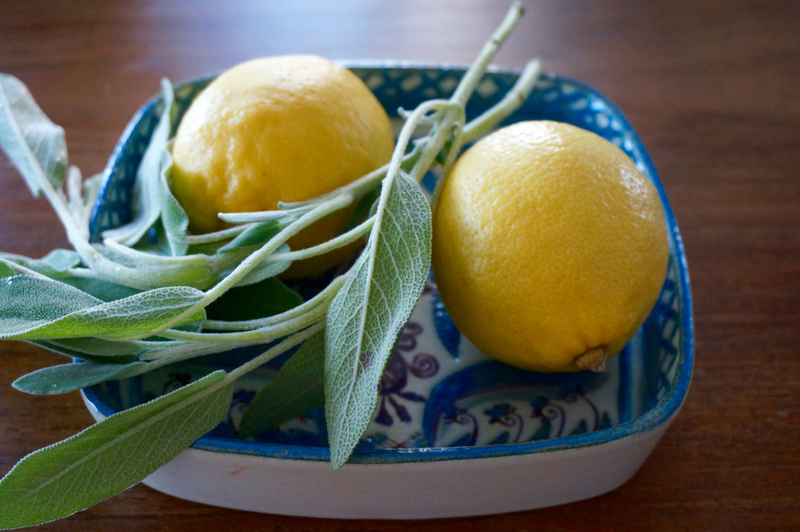 And the flavor is earthy and wholesome, thanks to the combination of milk, sage, and garlic, but with a welcoming zing of lemon zest. Nothing would be better for toasting the end of a dairy-free diet. Remove the chicken from its packaging and discard the bundle of giblets from inside. Pat the chicken dry with a paper towel. Mix together the salt and pepper, and rub this all over the chicken. Warm the tablespoon of oil in a large skillet over medium to medium-high heat. Sear the chicken on all sides until deep golden-brown; use tongs to help turn it as you sear. The heat in the pan should be hot enough that you hear a constant sizzle as you sear the chicken; reduce the heat slightly if the oil begins to smoke. Transfer the seared chicken to the bowl of a 6-quart or larger slow cooker and lay it breast-side down (this is important; you want the breast to be in the milk). Pour off any grease left in the pan and return the pan to heat. Add the cider and scrape up any browned bits from the bottom of the pan as the cider simmers. Continue simmering the cider until it has reduced by roughly half. Pour the cider over the chicken. 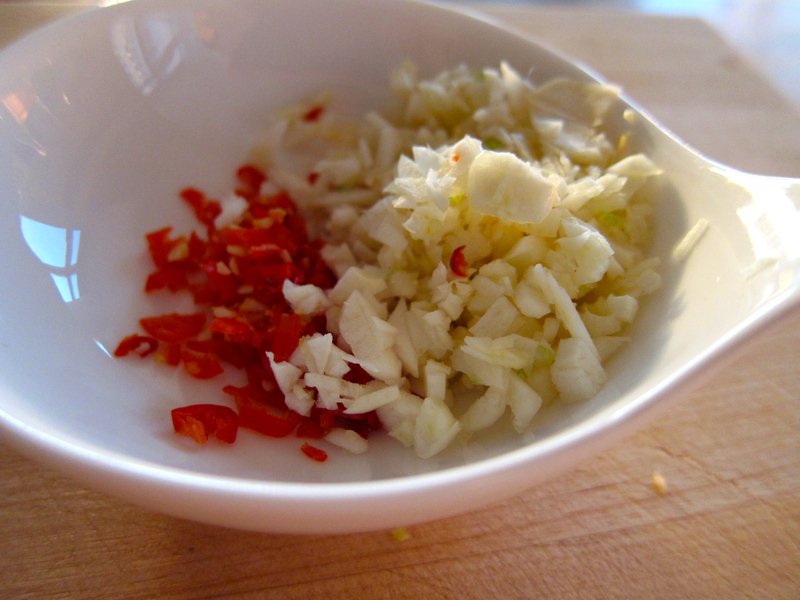 Rub any loose papery skins from the garlic cloves, but otherwise leave them in their peels. Scatter the garlic cloves, sage leaves, cinnamon stick, and lemon zest on top of and around the chicken, then pour the milk over top. 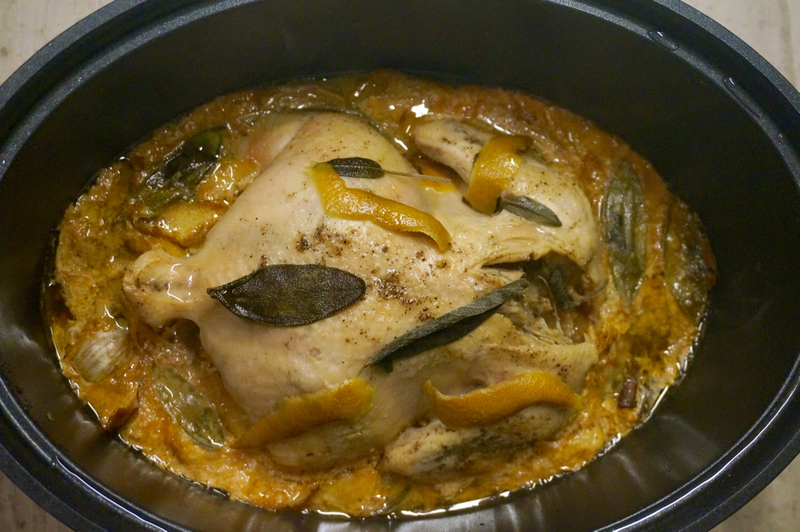 Cover the slow cooker and cook for 4 to 6 hours on low heat. To serve, lift the chicken from the slow cooker and transfer it to a cutting board; the legs or wings will probably fall off. Carve the chicken into pieces (I couldn’t carve it because it was too tender, so I served it in big pieces as they came off the chicken); you can leave the skin on or remove it, as you like. Scoop the garlic cloves from the cooking liquid and scatter them over the chicken pieces. Transfer the liquid to a serving dish, straining if you’d prefer to remove the solid curds (although they’re tasty!). Serve everything hot. We decided to drive to Platres, a village resort up near the highest point of Cyprus, on the Troodos mountains. Even though it was mid-April, the weather was wintery. Low clouds played hide-and-seek among the mountain tops, coming down enough to envelop our cars in a thin fog. The sun triumphed occasionally, only to be followed by a short hailstorm and then rain and then back to sun again. Above us, we could see that the highest peaks were snow covered from the night before. It started to drizzle. “Lunch?” I asked. Everyone nodded. We walked into the closest restaurant, doubtful it was even open. The whole village was quiet and empty. This was Easter week and much earlier than the crowded tourist season. The door to the restaurant opened and we walked in to a dining room empty of any customers, except for three men at a table, with a laptop open. “Come in,” one of them said, the apparent owner. We sat down and he explained what was available for the day. It was a limited menu but there was enough there to entice us. Steve and JC ordered ttavas, a lamb stew, cooked in onions and tomatoes with a heavy dose of cumin. Traditionally cooked in clay pots in outdoor wood-burning ovens, I always remember it from my childhood, tasting of sweet earth and smoke. When it arrived at our table and Steve took a bite, his eyes lit up. “This is amazing,” he said. JC nodded in agreement. Last week, back in New York, I decided to create a version of it, tweaking my mom’s recipe and using chicken instead of lamb. No clay pots or wood-burning ovens are involved, but it will get you as close as possible to a cold spring afternoon in Platres without leaving your home. In a large oven-safe pot with lid, heat olive-oil over medium heat. Add onions, garlic, and ½ teaspoon of salt. 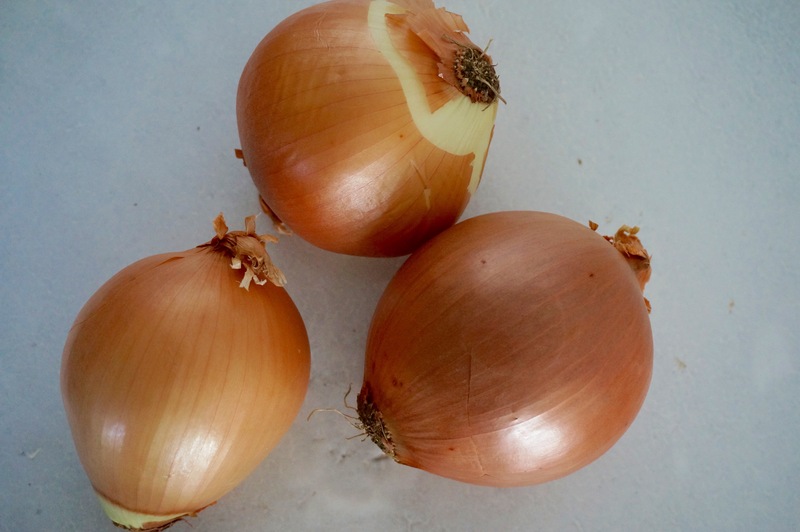 Cook, stirring frequently, until onions are soft but have not turned brown, about 15 minutes. 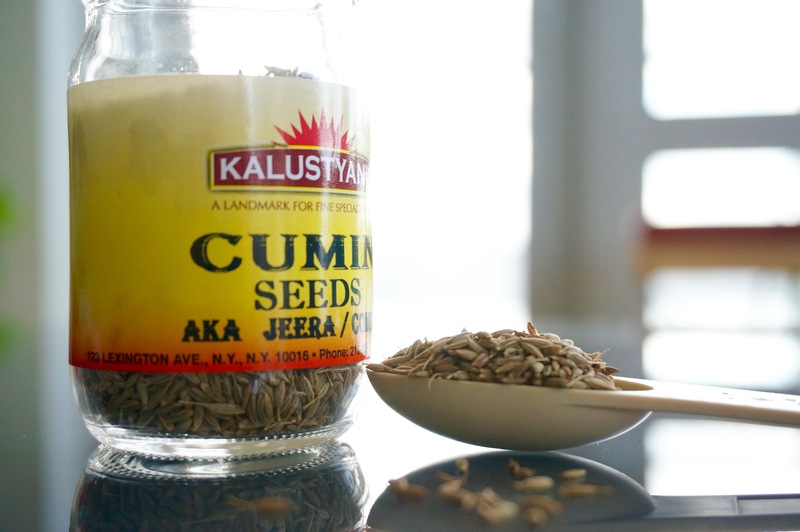 Add cumin, and cook, stirring constantly for another minute. Add diced tomatoes and their juices, wine, vinegar, bay leaves, an additional 1 teaspoon of salt, and freshly ground black pepper. Stir to combine well. Add chicken thighs and nestle them in the onion mixture to cover them. Bring back to a gentle simmer, cover pot and place in oven. 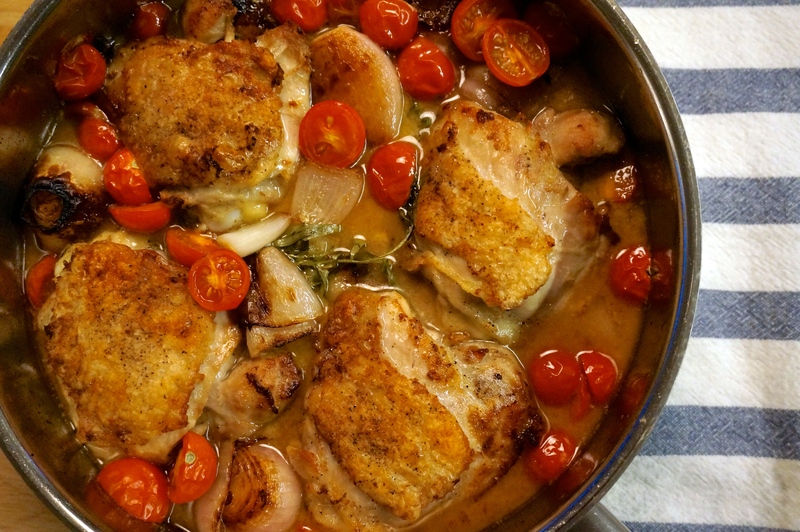 To serve, use two forks to separate chicken thighs into large pieces. 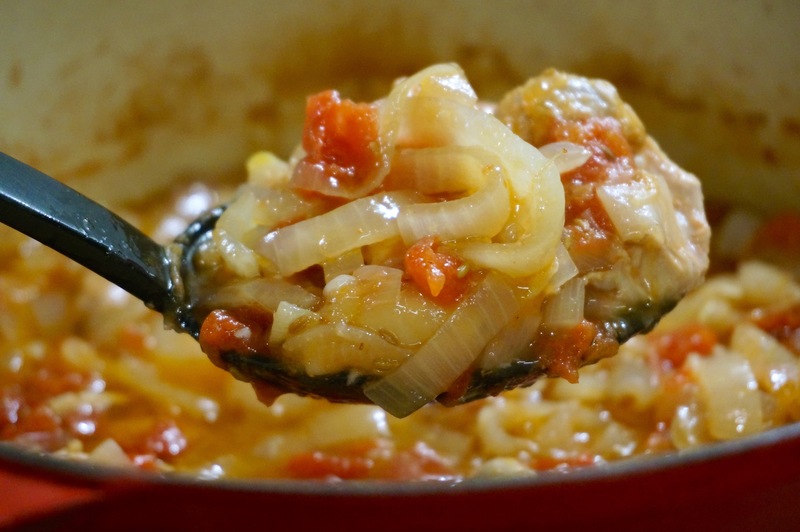 Serve in shallow bowls with chunks of bread to sop up the onions and tomatoes. I work close to Kalustyan’s, the spice and food emporium that pretty much every chef in the world knows and buys from (they ship everything worldwide). It’s an unassuming place, next to a takeout Indian restaurant called Curry in a Hurry. Inside, there are more spices, sauces, frozen foods, and ingredients than you could ever imagine. The incredibly narrow aisles are surrounded on both sides with shelves up to the ceiling, packed with bags of different sizes that are filled with exotic sounding spices like Anardana (sour pomegranate seeds used as a souring agent), Radhuni (an incredibly pungent spice from Bengal), Jaffna (a hot curry powder from Sri Lanka), and on and on. Whenever I am there, it’s hard not to buy things, especially if I’ve never heard of them before, despite not being able to smell or taste them (the bags are sealed shut). I often bring them home and look them up online to try and find a use for them. 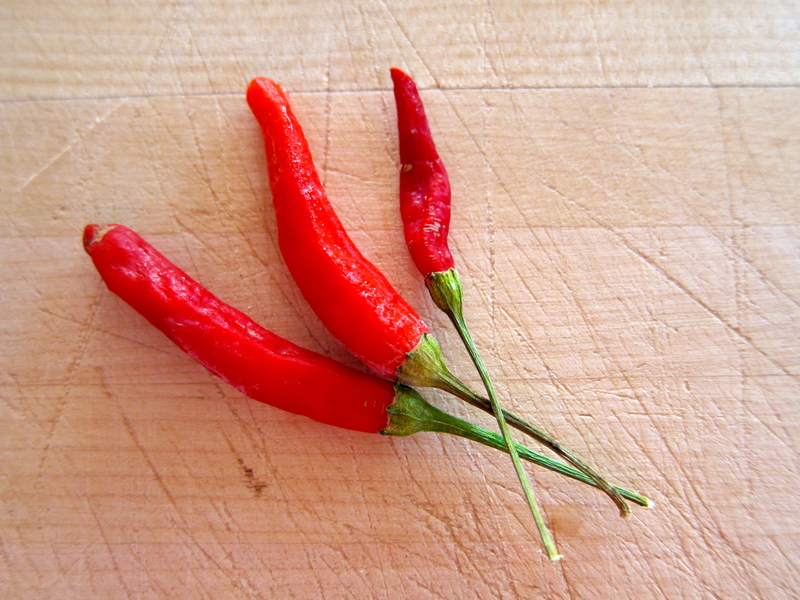 More than once, they end up forgotten in the back of the spice pantry and eventually thrown out. 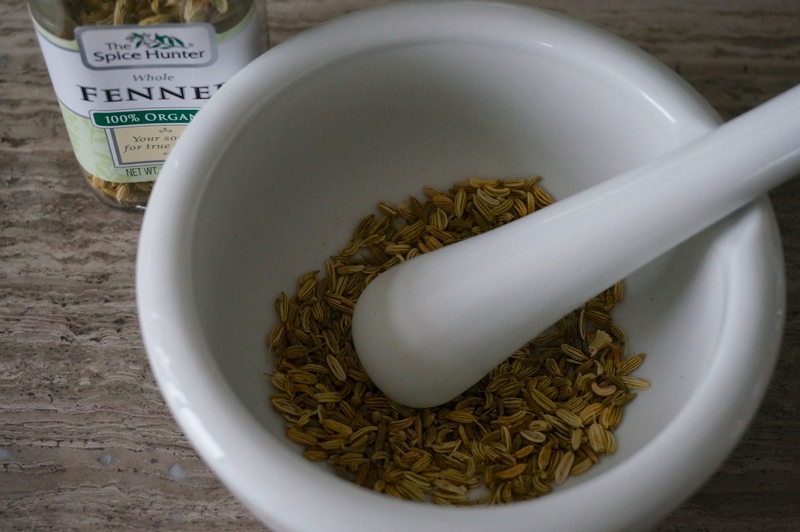 This time I bought three things I already knew about and had wanted to buy for a while: star anise, ras el hanout (a Moroccan spice blend), and za’atar (a Middle-Eastern spice blend that varies from country to country – I bought the Lebanese kind). I’ve already used the ras el hanout to make a rub for pork chops that I pan fried in some oil and finished in the oven. And the za’tar has gone over yogurt with olive oil (known as labneh) and fresh tomatoes with olive oil and salt. The star anise is waiting its turn. The point I am trying to make is that I am a flavor explorer, as is Steve. Whenever we are in an ethnic market or grocery store, we’ll end up buying things that we’ve never tasted before, always searching for new gustatory experiences. So it might come as a surprise when I tell you that until a few months ago I couldn’t really tell you what tarragon tasted like. 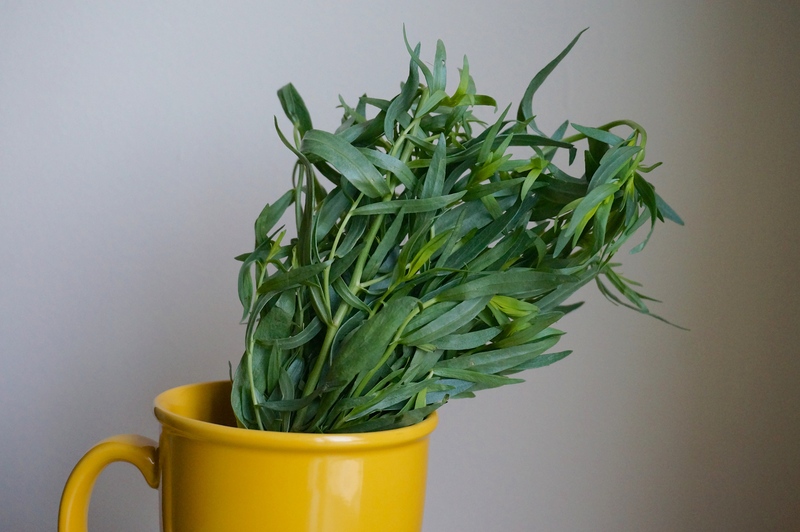 I knew about it, I’d seen it many times in the store, but I never cooked with it or remembered eating anything with tarragon in it. And then the tarragon epiphany happened. I don’t remember which recipe started this but there was one recipe I tried that called for tarragon and as soon as I bought it and smelled and tasted the sweet anise-like aroma and flavor I knew I would use a lot more of it, something I have happily done since then. Today’s recipe appeared in the New York Times and I liked its simplicity and flavor profile. I tried to modify it to maintain the crisp skin of the thighs but my attempts were unsuccessful. The only thing that could work is placing the pan under a hot broiler for a few minutes at the end, in order to recrisp the chicken skin. Rinse chicken thighs and pat them very dry with paper towels. Trip any excess fat or skin. Sprinkle over both sides of thighs the flour, salt and pepper. Melt the butter in a large, heavy-bottomed pot or skillet set over medium-high heat. When the butter foams, cook the thighs, skin-side down first, in batches if necessary, until the skin is well browned and crisp, about 7-8 minutes. Turn thighs over and cook for another 1-2 minutes. Remove from pot and set aside. Add the whole shallots to the pot and sauté them in the butter and chicken fat until they begin to soften and caramelize, approximately 6 to 8 minutes. 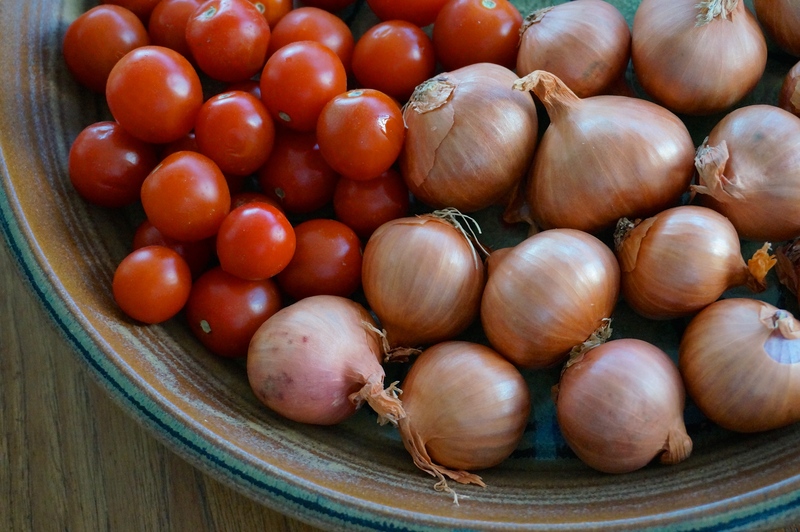 Remove the shallots from the pot. Lower the heat to medium low. Add the wine to deglaze the pot, stirring with a heatproof spatula, then add the mustard and tarragon. Stir until mustard is almost fully combined. Add the chicken thighs skin side up and nestle the shallots between them. Cover the pot, turn the heat to low and simmer for 25-30 minutes. Remove the lid, raise the heat to medium and allow the sauce to reduce and thicken, 15 to 20 minutes. Add the tomatoes and stir lightly to combine. Serve immediately. If you want to recrisp the chicken skin, place under a hot broiler for a couple of minutes. One of the gifts Steve gave me for Christmas was a book called “The Flavor Bible: The Essential Guide to Culinary Creativity, Based on the Wisdom of America’s Most Imaginative Chefs .” Unlike a cookbook, this is more of a reference book. Let’s say you found some sorrel in your local market and you’ve never cooked with it before. You don’t even know what it tastes like. A quick look at the book will tell you that sorrel goes with lentils, fish, and eggs but that it should be avoided in a salad. Or that sorrel, nutmeg, and ricotta cheese is a great combination. I’d like to think that I have a really good appreciation for flavor combinations. Often when I cook without a recipe, I can actually imagine how different things will taste together and know what I should add to a dish to make it better without actually tasting it. Or at least I think I do. There are times when my flavor experiments fail, but others when they are really successful (like my broccoli, anchovy, black garlic concoction that ended up being incredibly addictive; I’m working on a recipe and will post soon). So, when I saw a recipe for Caramel Chicken in Bon Appétit I was instantly intrigued and suspicious. I just couldn’t imagine those two flavors working together, which only made me more curious. So, I tried it and I was amazed at how well the recipe worked. Though, to be fair, the caramel here is very subtle. It’s more of a sour/salty sauce with caramel undertones. But it works. The problem with the original recipe was that it resulted in tough pieces of chicken covered in unappetizing fatty skin. So, I made a few changes and tried it again. This time, not only was the taste amazing, but the chicken was incredibly tender, with no fatty skin to distract from its caramel goodness. 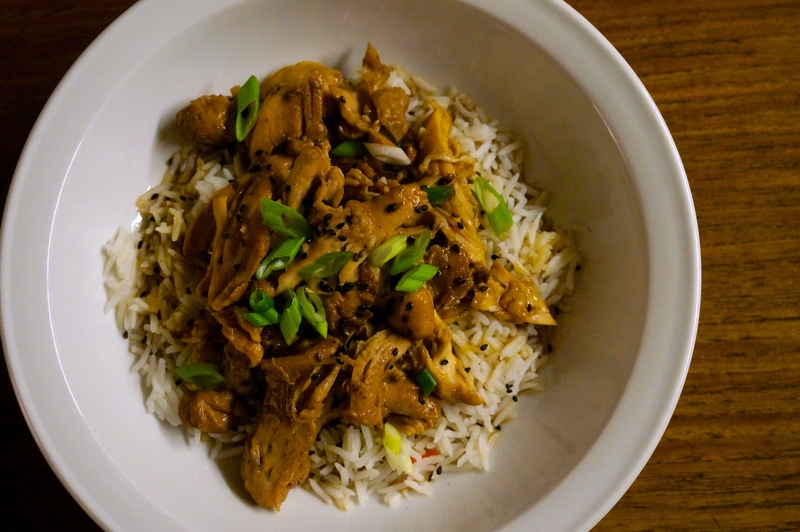 And I realized that the recipe name (Caramel Chicken) omitted a major component of the dish: the slow cooked garlic cloves that melt in your mouth and deliver the much needed depth to this dish. So, in addition to modifying the recipe, I adjusted its name. Try it. You won’t be disappointed. Preheat oven at 325° F.
Heat oil in a large wide oven-safe pot over medium-high heat. Season chicken thighs with salt and pepper and add three or four thighs in the pot. The thighs should not be crowded. Cook for 10-15 seconds on one side, turn and cook for another 10-15 seconds on second side (the thighs will not brown; they will just start to turn white). Remove thighs from pot and transfer to a plate. Don’t worry if a little bit of meat gets stuck at the bottom of the pot. Just leave it in there. Repeat the process for all the thighs. Add garlic to pot and cook, stirring often, until golden, about 2 minutes; transfer to plate with chicken. Pour off fat from pot. 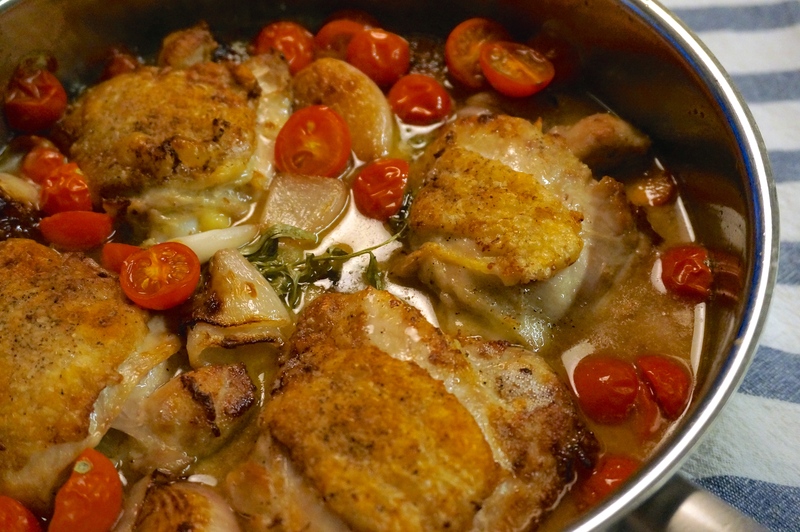 Return pot to medium-high heat and add ½ cup water, scraping up browned bits of chicken. Add brown sugar; stir to dissolve, then cook, stirring, until mixture thickens and turns a deep amber color, about 4 minutes. 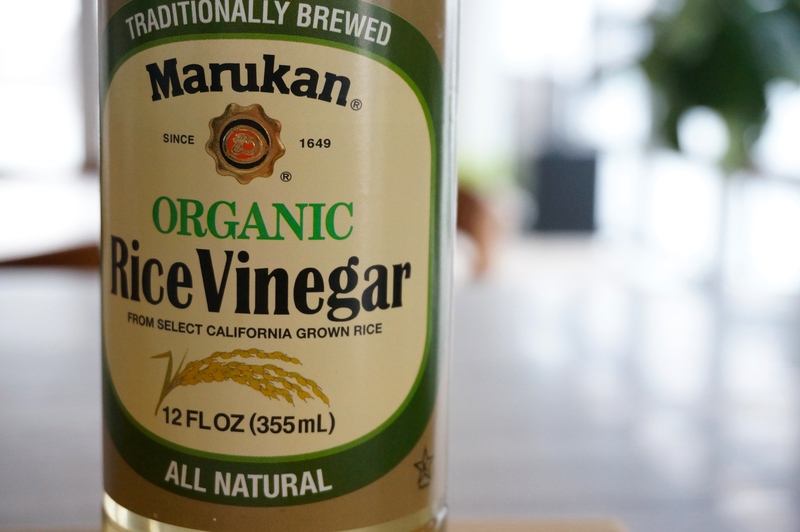 Carefully add vinegar (it may bubble up; sugar will crystallize); stir to dissolve sugar. Add ginger, broth, and soy sauce, then add chicken and garlic. Bring to a boil, cover and place in oven. Cook for one hour, until thighs are fully cooked. Remove thighs and garlic from the pot and transfer to a plate. Using two forks, separate thighs in bite-sized pieces. 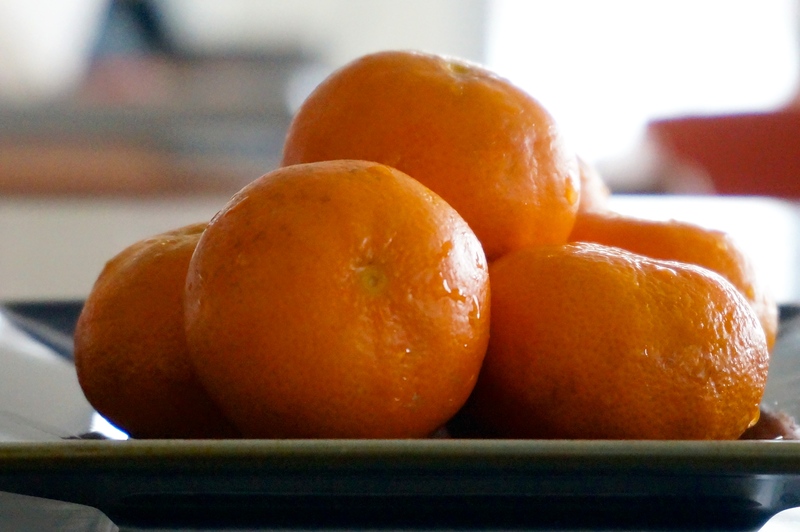 Discard ginger slices. Place the pot on high heat and bring cooking liquid to a boil. Cook until slightly thickened, about 10-12 minutes. Return chicken and garlic to pot; turn to coat. 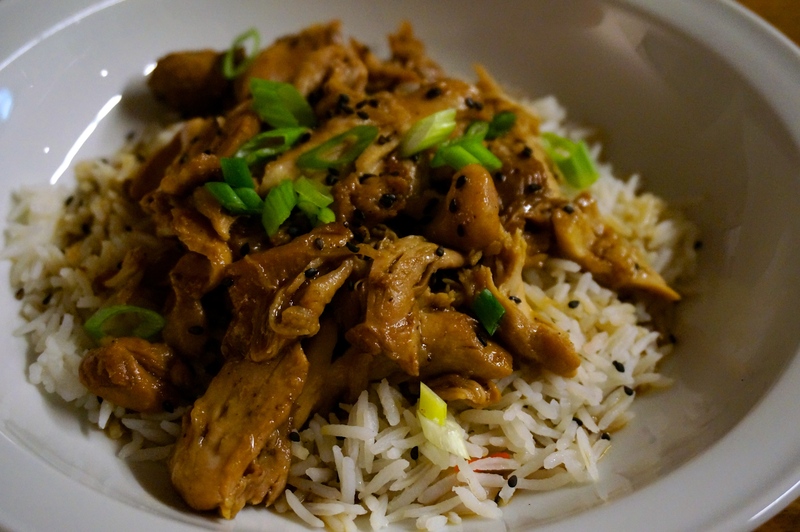 Serve over plain white rice and top with black sesame seeds (optional) and chopped scallions. I’m back from a little over three weeks of travel and I am so happy to be home again. I’ve always been a homebody, so being away from home for long periods of time makes me feel rootless and restless. Even when I am in New York I’ve been known to resist being out of the apartment for too long. I like to come home, regroup, and then go out again. One of my trips was back home to visit my family. It was a somewhat special trip because I had a reunion of sorts with three of my friends from high school, two of whom I hadn’t seen in 25 years. I marveled at how little we have changed in some things (our looks in general, our mannerisms, many of our interests) and how much in others (the inability of some us to read menus in dim restaurant lights, having teenage kids). The older I get, the more I find myself going down memory lane and remembering little details about my childhood. The four of us, along with my sister who was there with us, remembered and laughed about some silly things, like our predilection for writing bad poems which we exchanged and commented on with the seriousness of a grand literary salon. Inevitably, we compared our teenage years with those of their own kids. And, as it seems to be the habit of every generation, we lamented the fact that “back in our days” things were different, or better, or less complicated. Truth be told, things were simpler then. We were a lot more innocent, as was the world in which we lived. With no Internet or any connected devices, our world was limited to what was physically close to us and that made things a lot less complex. While I was at home, I also did one of my favorite activities: go to the grocery store. I love to walk the aisles and rediscover food that I grew up with but have either completely forgotten or haven’t tasted in years. Like the slightly sweetened sesame rusks called glystarkes or the fried dough balls soaked in honey syrup called loukoumades. Every morning I ate a fresh kolokoti, a turnover filled with cooked pumpkin, raisins, and bulgur wheat. 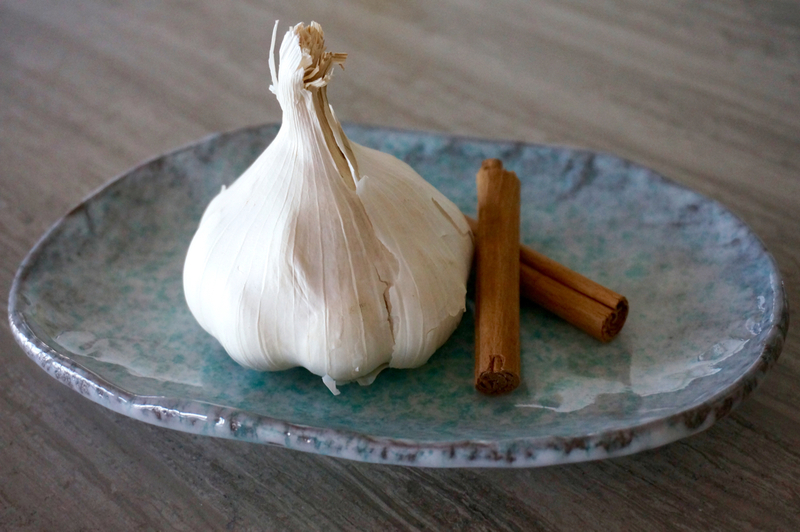 I started this blog post thinking I was going to somehow bring it back to the taste of licorice or anise, which is a key element of this recipe I want to share with you today. I had envisioned talking about how as a kid I watched The Little House on the Prairie and always wondered what this “sweet root” (as the greek subtitles translated it) was that the kids seemed to buy at the pharmacy. And how it turned out to be licorice, a word that comes from the greek glykoriza which means sweet root. 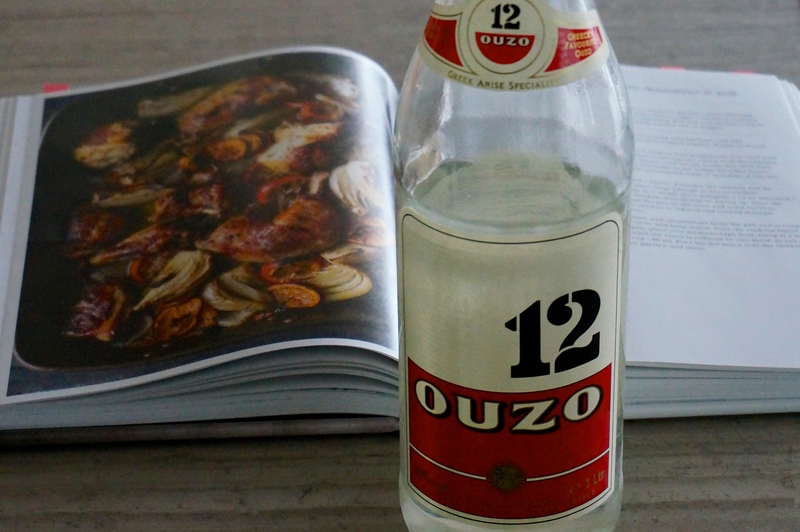 And how I realized I hated licorice, though I still like ouzo, especially on a hot summer night, turned milky with the addition of ice cold water. But in the end, I couldn’t really find my way to all that and I figured I would just give you this recipe from “Jerusalem: A Cookbook .” It’s an extraordinary dish, made even more amazing by its simplicity. Put the first eight ingredients in a large bowl and whisk well. 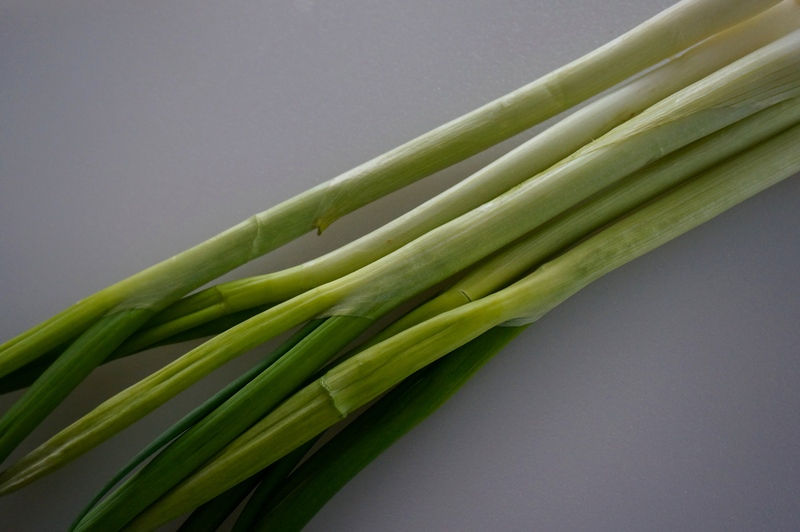 Cut each fennel bulb in half lengthwise and then cut each half into 4 wedges. 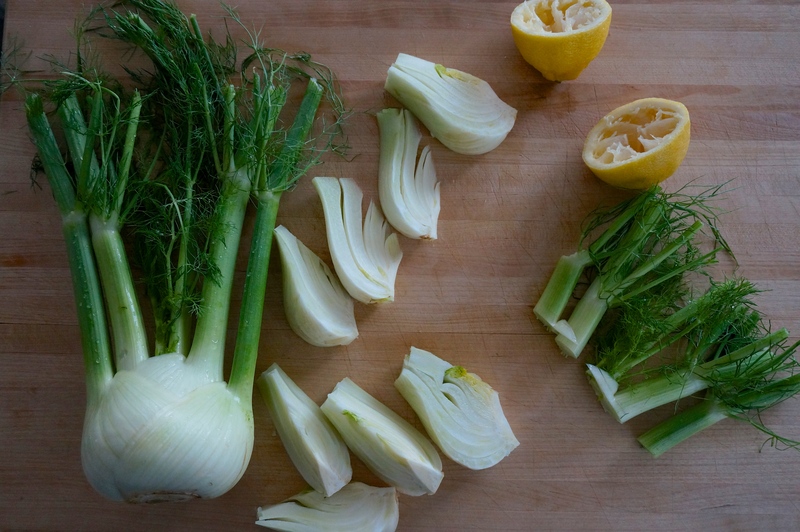 Add the fennel to the bowl along with the chicken thighs, clementine slices, thyme, and fennel seeds. Using your hands, mix everything well and then cover and leave to marinate in the fridge for a few hours or overnight (if you don’t have the time, skip the marinating stage). Preheat the oven to 475º F / 220º C. Transfer the chicken and all the ingredients in the bowl, along with the liquid marinade, in a baking sheet that is large enough to accommodate everything without being overcrowded (this will help the chicken to brown). Make sure that the skin of the chicken thighs is facing up. Put the pan in the preheated oven and roast for 35-45 minutes until the chicken is brown and cooked through. Remove from the oven. 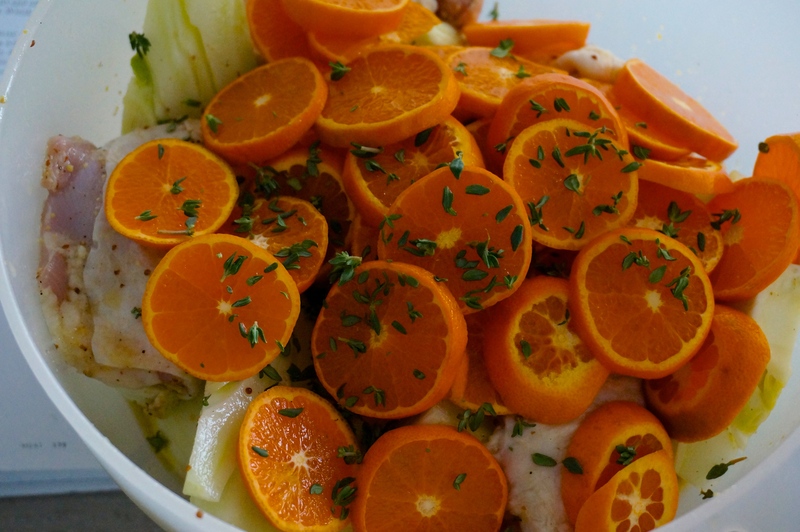 Lift the chicken, fennel and clementines from the pan and put on a serving platter. Cover and keep warm. Pour the cooking liquid into a small saucepan and place over medium-high heat. Bring to a boil and then simmer until the sauce is reduced by one third. You should be left with about 1/3 cup (80 ml). Pour the hot sauce of the chicken and top with some parsley before serving. When I tell people that I love to cook, the first thing many of them ask me is “what’s your favorite thing to cook?” I am always stumped by that question. I mean, with all the different foods and cuisines and ingredients in the world, how could I have just one thing that is my favorite thing to cook? Some ask me a variation of that question: “What type of cuisine do you most like to cook?” That’s a better question but one that I still have no answer for. There was a definite time about 20 years ago when I went through a Chinese phase. I bought books and woks and steamers and cooked Chinese food all the time. I had a mini Caribbean phase, mainly due to a cookbook someone gave me, and a mini Indonesian phase, again because of a cookbook I bought at a used-bookstore. But nowadays I cook food from many different cuisines. However, there is one type of cuisine that I have cooked very little from even though it’s one of my absolute favorites to eat: Thai food. I don’t know why but I never cooked much Thai food. Maybe it’s because nobody ever gave me a Thai cookbook. 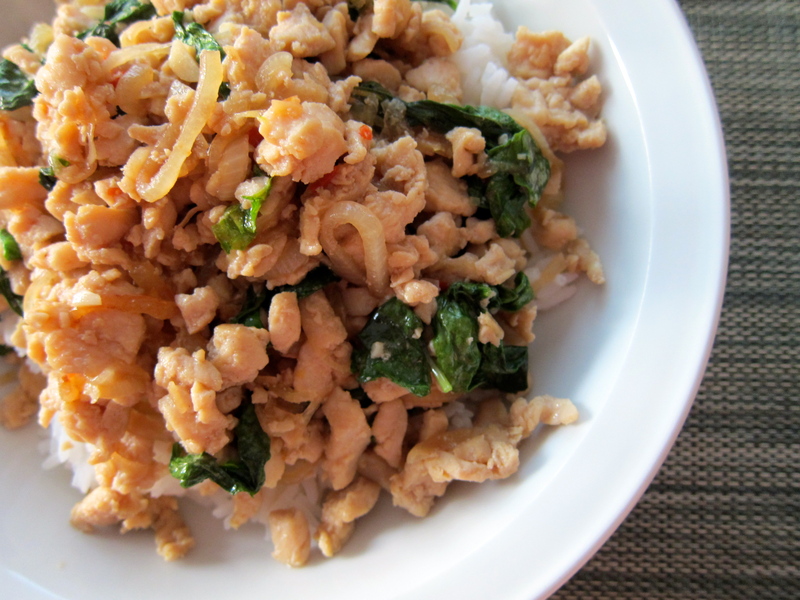 Nevertheless, Thai food (good Thai food) is an absolute delight to eat. Sweet and spicy, with huge umami flavors thanks to the use of fermented fish in the form of dried shrimp or fish sauce (nam pla), with abundant use of chiles and herbs, Thai food is a real party for your mouth. Unfortunately, most of the time in New York we get to eat bad Thai food with goopy sauces and huge chucks of the ubiquitous green and red italian peppers. I once ordered a pad thai at a restaurant in my neighborhood that was downright inedible. I mean, how difficult is it to make pad thai? This is a deceptively simple dish to make. It takes a little time to prepare and almost no time to cook. But it packs so much flavor, it will knock your socks off. Don’t be concerned that there is only a little sauce in your pan when you’ve finished cooking. It doesn’t need a thick and syrupy sauce like what you’d get in most restaurants. Serve it over plain white rice and you’ll see what I mean. Using a very sharp knife, slice the chicken breasts crosswise into thin strips, about 1/4 inch wide. Then turn the cutting board 90° and chop the chicken strips into very small pieces. It should end up looking like coarse ground chicken. In a medium bowl, combine the chicken with the fish sauce, soy sauce, water, and sugar and let it sit at room temperature for about 15 minutes. 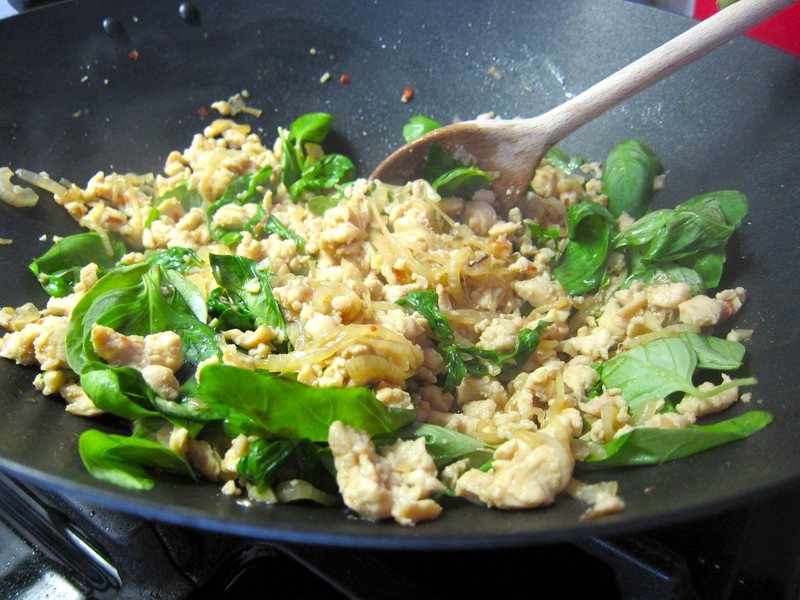 In a large nonstick frying pan or a wok, heat the oil over moderately high heat. Add the onion and cook, stirring, for about 2 minutes, until the onion has softened. Stir in the chiles and garlic and cook, stirring, 30 seconds longer. Remove the chicken from the marinade with a slotted spoon and add it to the hot pan (very little marinade will remain in the bowl). Cook until no longer pink, stirring, about 3 minutes. Add the marinade left in the bowl and cook 30 seconds longer. 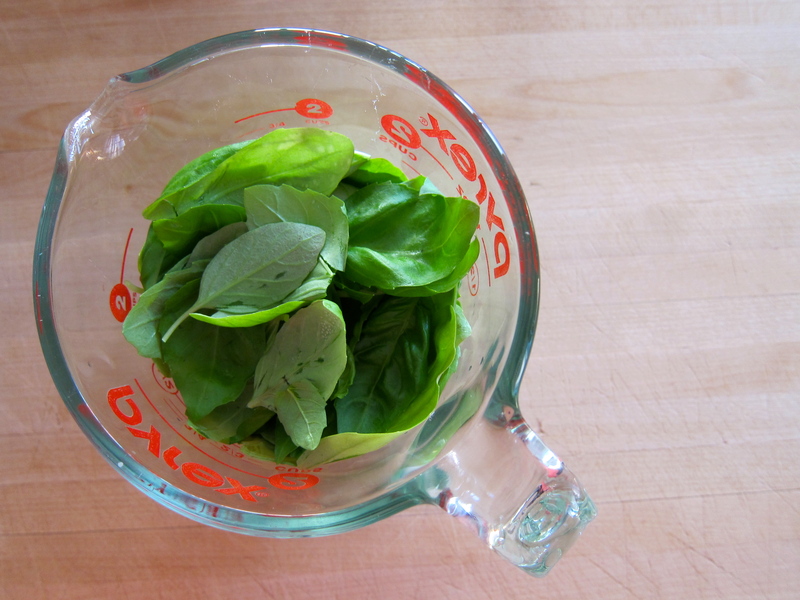 Remove from the heat and stir in the basil until it’s wilted. Serve immediately over plain rice.